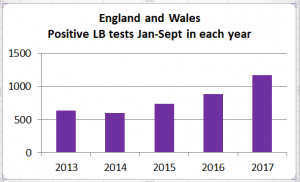 Public Health England has now published provisional figures for Lyme disease for the third quarter of 2017 in the Health Protection Report , covering the period from January to September (weeks 0-39). As usual, this represents laboratory confirmed cases by the Rare and Imported Pathogens Laboratory (RIPL), based on positive Lyme serology tests of samples submitted to them. The total number of laboratory confirmed cases for this time period has increased significantly from 867 in 2016, to 1171 in 2017. Only 8% reported foreign travel which is lower than previous years. This represents an increase of 32%* over 2016, as shown below. The report links this increase to “weather patterns affecting tick numbers, increased awareness in healthcare professionals and the public, and increased demand for Lyme disease testing.” It is likely that all the effort and hard work involved in raising awareness, including via the media, and online social media is now producing a positive result. In 2016 the total for all four quarters was 1156, and this has already been exceeded in the first 9 months of 2017. It will be interesting to see what the final total for the 2017 will be once figures for the final quarter (weeks 40-52) are included and provisional figures confirmed. Lyme Disease Action’s Medical Director says “The scale of this increase is significant. Despite recent increased awareness, cases will still be being misdiagnosed or undiagnosed. There is no record of numbers of cases clinically diagnosed and treated without serology, so we have no way of knowing whether the total number of these cases is also increasing by a similar amount. So once again we ask “Where are the specialist clinics?”. * – note we have used the 2016 single quarter figures (133+170+584=887) to arrive at an increase of 32%. It the HPR total figure of 867 for 2016 is correct, the rise would be 35%. we are seeking clarity.